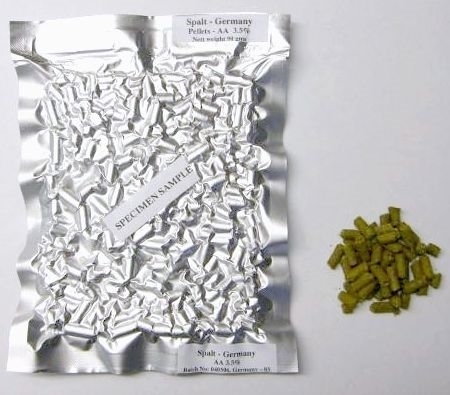 Chinook hops are of medium intensity, spicy, piney, distinctive grapefruit. Use caution when adding to early boil, as grapefruit can dominate. Pedigree From a cross between Petham Golding and a USDA-selected male with high alpha acids and good storage properties. Yield 2000 - 2500 kg./ha. or 1780 - 2230 lb./ac. Disease/Pest Susceptibility Tolerant to infection with Prunus necrotic ring-spot virus, moderately resistant to downy mildew. Not excessively sensitive to insects. Cone-Structure Long, medium-compact with turned outward petals. Storageability 65 - 70% alpha acids remaining after 6 months storage at 20°C. General Trade Perception A high alpha-acids hop with an acceptable aroma profile. Additional Information Released in the US industry in 1985 and becoming increasingly popular with craft-brewers.